Share booth #8462 with others. Can’t find the right supplier for the unit or multi-dose packaging used in your operations? Pharmacy Automation Supplies (PAS) is your answer. Whether you’re an independent pharmacy supplying a local home with 30 day cold-seal cards, a retail store interested in supplying your patients a choice in the packaging they receive their prescription in, a high volume specialty LTC pharmacy using multi-dose cards, or a repackager using high volume heat seal cards with automation PAS has a solution. As a manufacturer our run & hold business model provides long run discounts and same day releases while our direct to end user sales channel eliminates brokers, middlemen, and wholesalers allowing you to get the most competitive pricing in the market. PAS’s blister card program supports our goal of being a cost saving solution for ALL the consumables used in pharmacy. 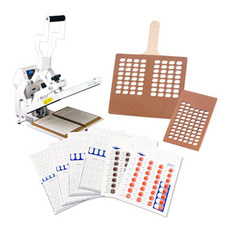 In addition to blister cards our 20 flexographic presses make us one of the industry’s largest manufacturers of Direct Thermal, Thermal Transfer, Laser, Piggyback, Reorder pull tab, Specialty, IV, and many more labels used in all pharmacy environments. PAS also manufactures paper bags and is a wholesale distributor of authentic Lexmark toners, thermal transfer ribbons, pharmacy vials, plastic bags, and more. Our mission has always been to help pharmacies save time, and increase profits, efficiency, and productivity and we deliver on that goal daily by helping our customers consolidate vendors without ever sacrificing price or quality.